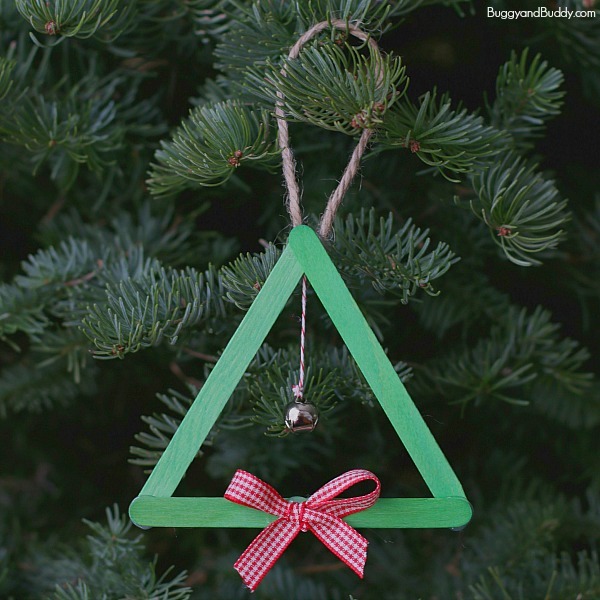 These Christmas popsicle stick ornaments are just ADORABLE! Go dig out the craft sticks and let the kids be creative this weekend! I don’t know what it is about craft sticks but every time I’m at the store I pop another packet in my basket! 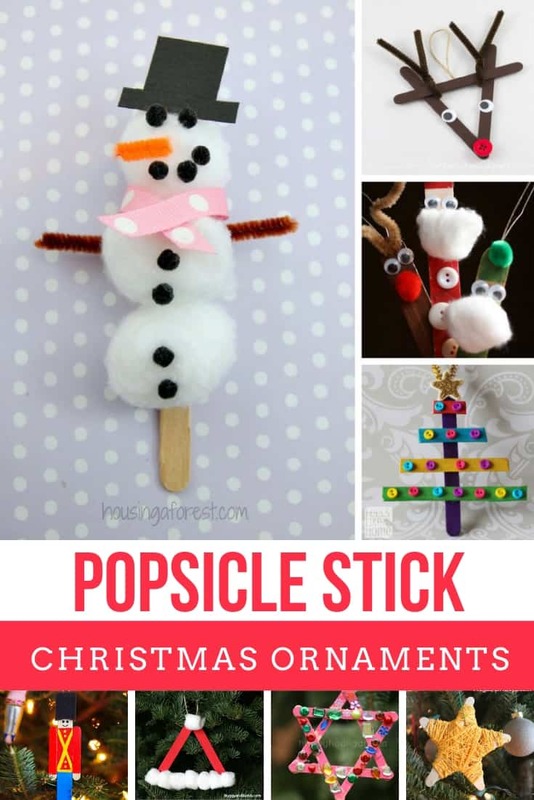 I’ve got such a vast supply now I’m always on the look out for crafts the kids can do with them, and since the Holiday season is fast approaching I thought it was time to look for some homemade Christmas decorations for kids to make with popsicle sticks! And I found so much inspiration! From Santas, and reindeers, ballerinas and angels, and even a Minion ornament! Oh and if you’re short on craft sticks you can always order some from the Dollar Tree! 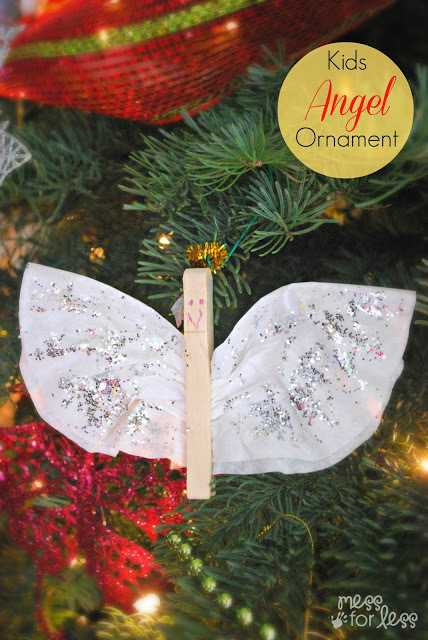 Angel Christmas Ornament – If an Angel ornament is a must for your tree then your kids will have fun making this homemade decoration. And if you switch up the colours you could make some butterflies too! 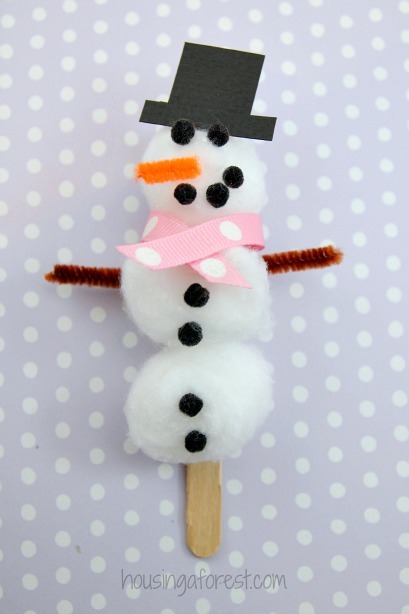 Cotton Ball Snowman Craft – Everyone needs a Frosty the Snowman to hang on their tree and this little guy is the perfect choice! 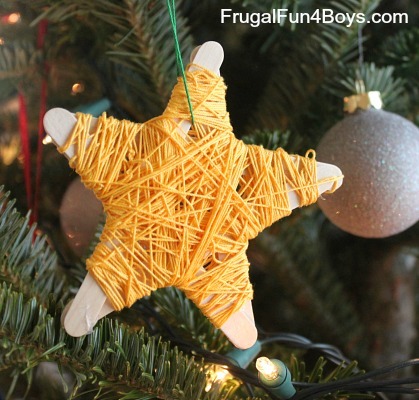 Popsicle Stick Star Christmas Ornaments – Here’s a homemade ornament that’s great for slightly older kids. 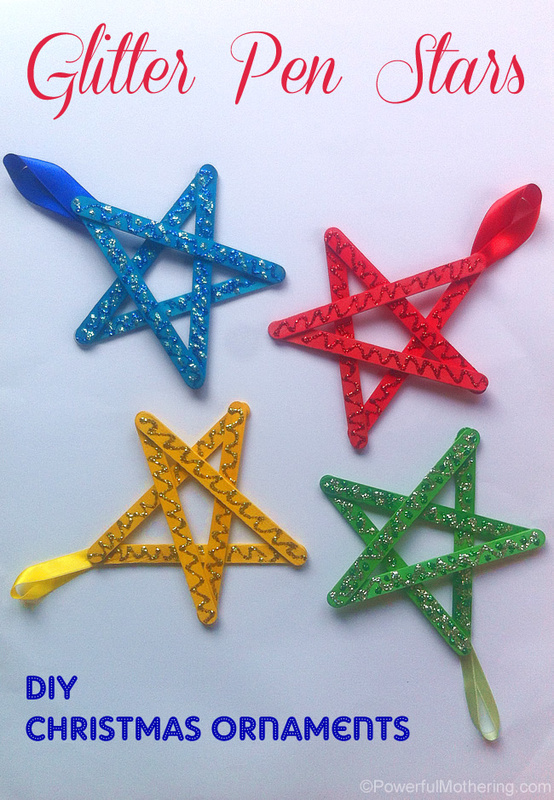 Once the star has been made from the craft sticks your child can sit and wrap it in brightly coloured yarn. I bet a rainbow coloured star would look brilliant! 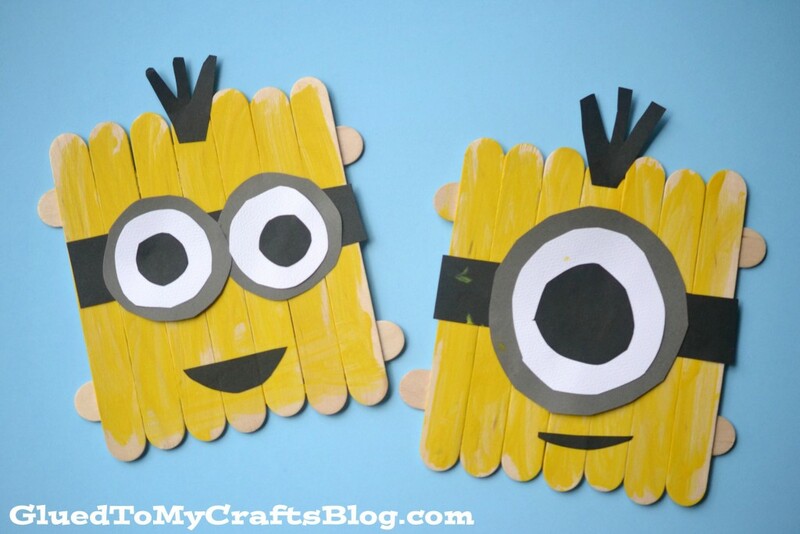 Popsicle Stick Minions – There’s no rule to state that your tree must be hung with “traditional” ornaments, so if you need to get your boy interested in crafting (or even Christmas decorations in general) show him how to make a Minion with craft sticks, and then add some thread to hang it from the tree! We have more Christmas decorations for boys right here! 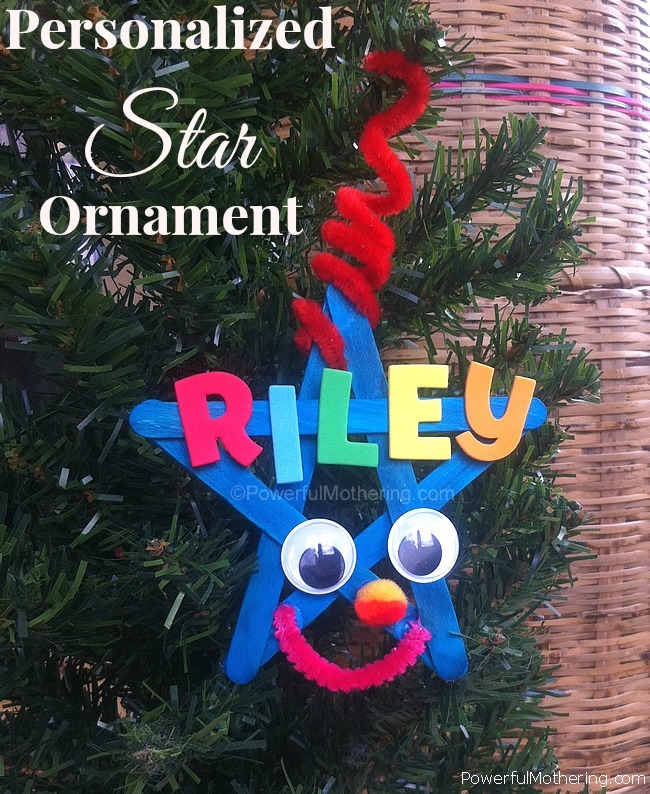 Personalized Kids Star Ornament – Oh this personalised ornament is ADORABLE! And so easy to make too. It’s the perfect gift to make for friends or classmates. 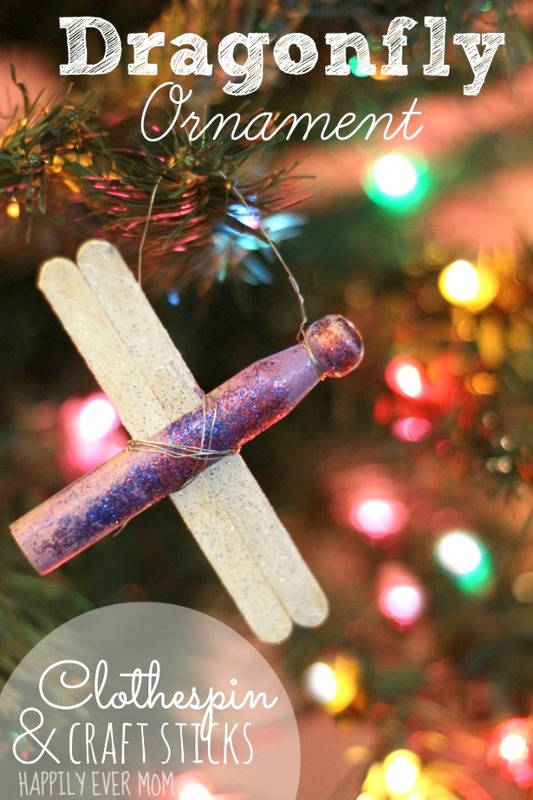 Dragonfly Ornament Kids Can Make: Clothespin, Craft Sticks, and Glitter! Dragonfly Ornament Kids Can Make: Clothespin, Craft Sticks, and Glitter! – Does your little girl love glitter as much as mine does? This is the ultimate Christmas decoration craft for glitter fans! Craft Stick Christmas Tree Ornaments – If you’re looking for homemade decorations for your toddler to make with you this Christmas tree ornament is perfect, and we love how they used a lid to make the tree topper! 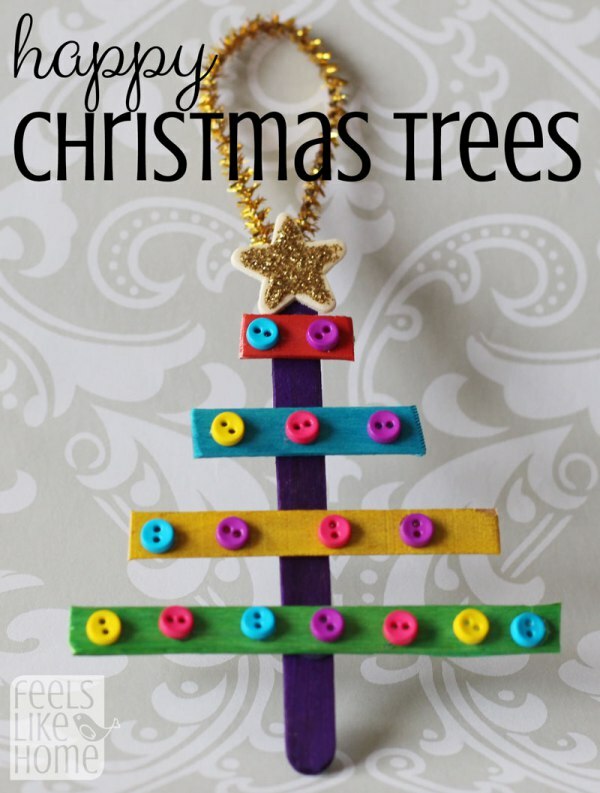 Popsicle Stick Christmas Trees – Here’s another FABULOUS idea for a Christmas tree ornament your kids can make. We love the little buttons acting as ornaments. 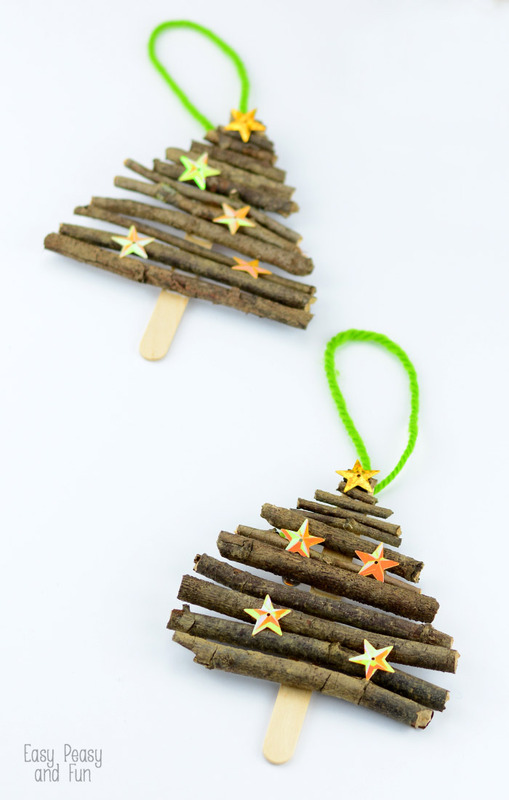 Popsicle Stick and Twigs Christmas Tree Ornaments – And here’s another idea for a Christmas tree ornament which is perfect for little boys who love to collect twigs! Popsicle Stick and Jingle Bell Christmas Tree Ornament – If your children love the Polar Express this would be the perfect homemade Christmas decoration for them to make to hang on the tree with the teeny jingle bell. 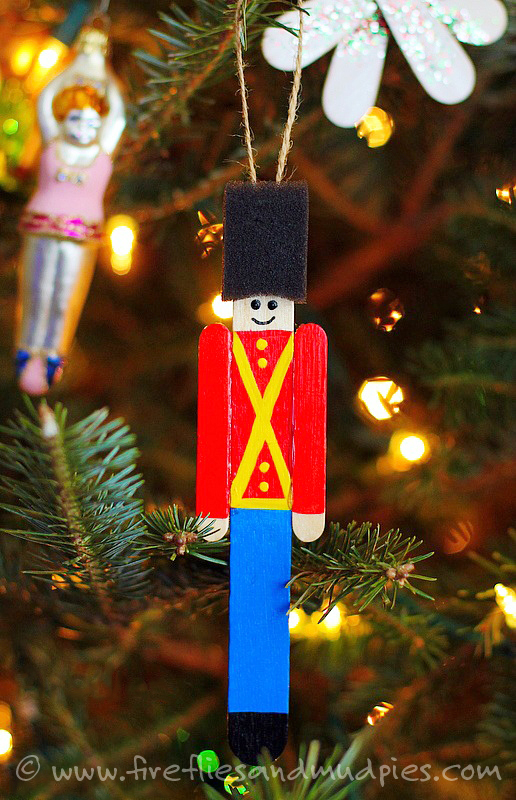 Toy Soldier Ornament – And here is a fabulous homemade decoration idea for the boys. How cute is this little soldier with his gold buttons and fantastic hat! 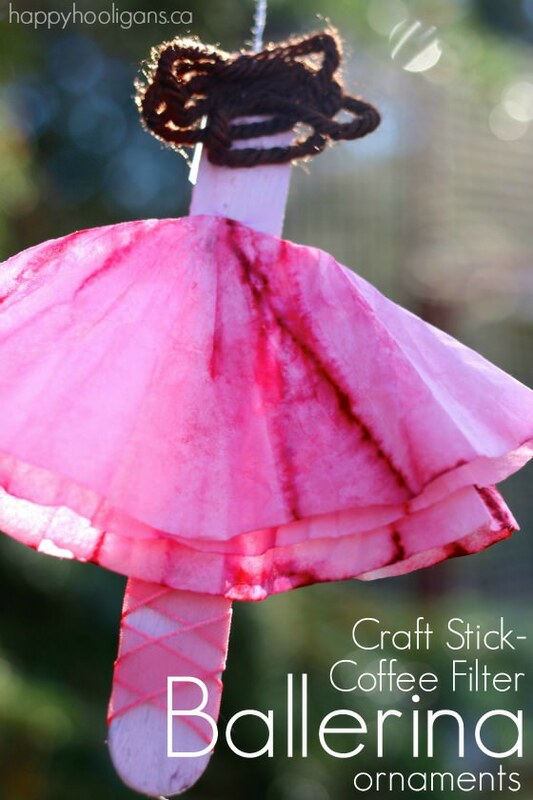 Ballerina Ornaments – If your little girl dreams of being a ballerina she will love this homemade ornament, she could make a whole cast of ballerinas to dance around the Christmas tree! We have more Christmas Decorations for Girls right here! 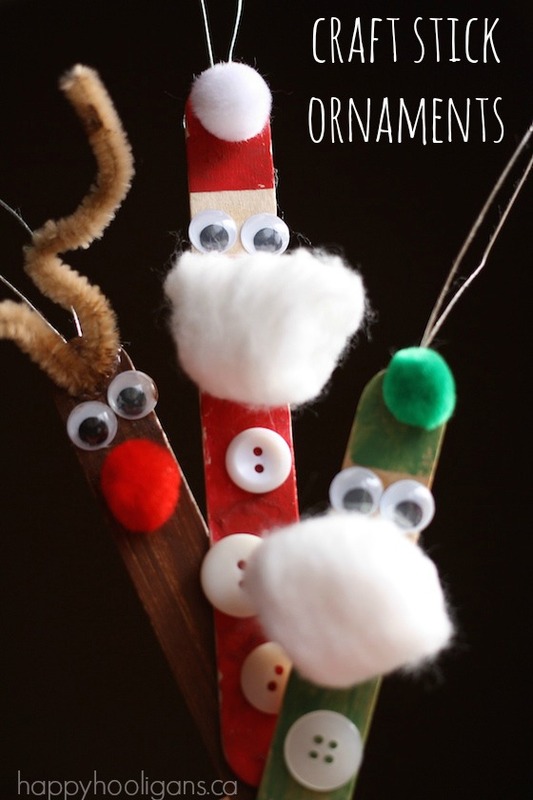 Craft Stick Santa Elf and Reindeer – How adorable are these little guys? That reindeer ornament is super cute with his red shiny nose! 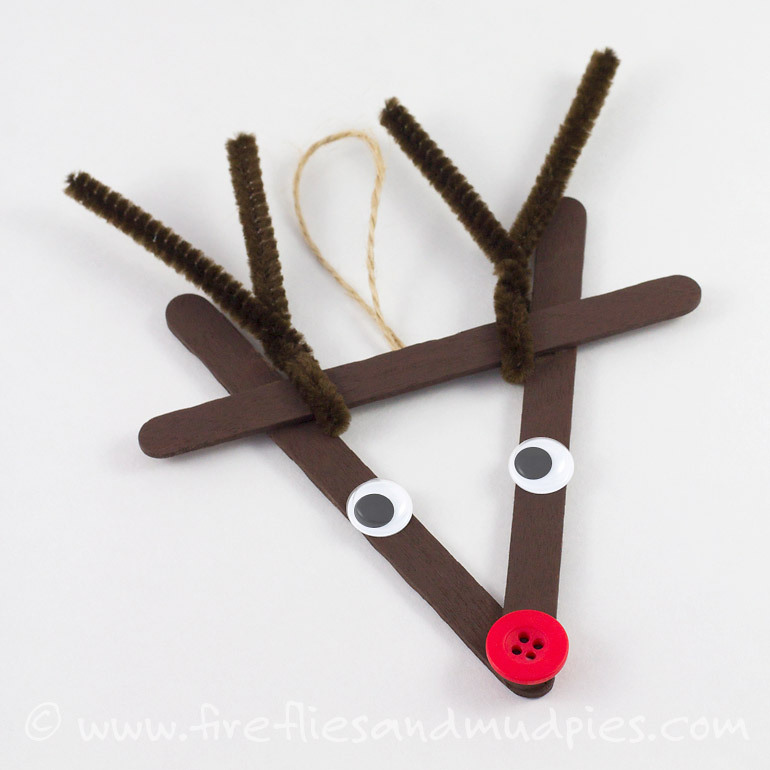 Craft Stick Reindeer Ornaments – Who knew there were so many different reindeer ornaments you could make from a simple set of craft sticks! Here’s another idea to inspire you. Santa Hat Homemade Christmas Ornament Using Craft Sticks – Ho Ho Ho! 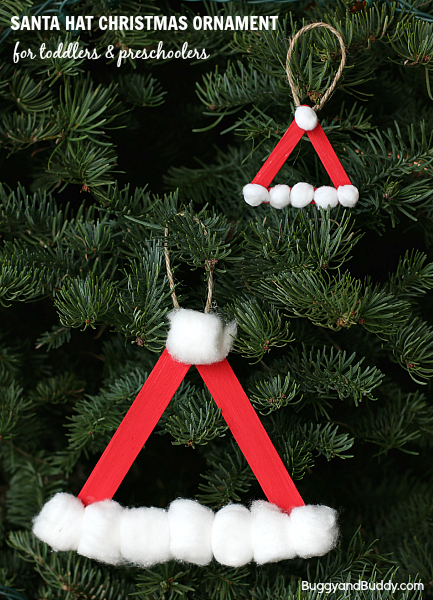 These craft stick santa hats are a fabulously festive addition to your tree and easy enough for toddlers to make. 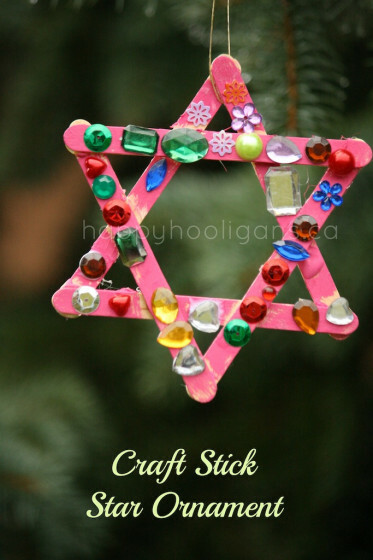 Craft Stick Star Ornaments for Toddlers – These craft stick stars will look so pretty hanging on the tree and your kids will have fun adding all of the sparkly jewels. Easy Christmas Crafts for Kids: Craft Stick Stars – Or you can take a slightly different approach and use glitter pens instead!